Salesforce Touch became generally available in the Winter '13 release. It is available in the Contact Manager, Group, Professional, Enterprise, Unlimited, and Developer Editions and according to the requirements, currently supports Apple iPads (2nd and 3rd generation) with iOS version 5 and up. Unfortunately, not everyone has an iPad to access, test out, or even debug the new Touch interface. Fear not, a simple change in your browser settings will allow you nearly the same access. First, make sure that you have the new "Touch" feature enabled for your org and the users that you want to test with. 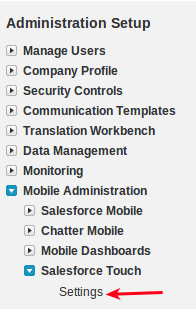 2) Under "Administration Setup," expand "Mobile Administration," "Salesforce Touch" and then click on "Settings:"
4) Next, ensure that Touch is enabled for the user account you are testing with by expanding "Manage Users" under "Administration Setup" and clicking on "Users:"
Now that "Touch" is enabled in all of the right places, it's time to change your browser's user agent, effectively allowing your browser to mimic Safari. Here's how to do that in Chrome. 1) Log out and change your URL to "login.salesforce.com"
If you're familiar with the Salesforce Mobile SDK, this will look familiar to you. 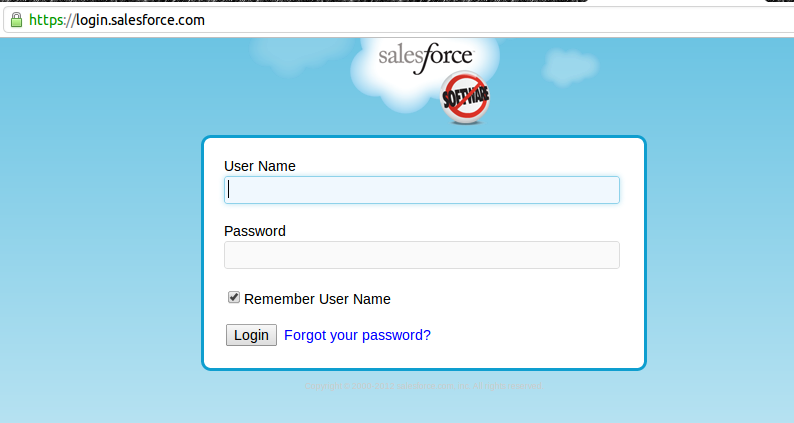 Take note that if you are logging in with an account with an Administrator profile, you will not experience the Salesforce Touch interface after logging in, but will rather be redirected to the normal "Setup" page. If anyone has a one of those new, shiny, touchscreen Windows 8 machines, I'd love to hear if the interface is "Touchable." Not using Chrome? Here's a link that may include information on how to change your user-agent setting w/in your browser of choice.